Though banana is the first solid food I like to introduce, you could also try avocado, or any fruit that is easy to mash or blend. Babies are only used to liquid at this point, so you may want to liquify the food at first by mixing in some breast milk or a little water. That way they can swallow it easier. But I have to admit I’ve never done that. I usually either mash the banana super well with a fork or my fingers, and give it like that, or mix it with yoghurt.Some people are against mixing foods together, saying your child won’t get used to the individual taste of the foods. I feel it is a personal decision. You can always start out offering each one separately and mix them later once you know they like both. One thing you do have to be prepared for is the possibility of your baby having a reaction to the food. 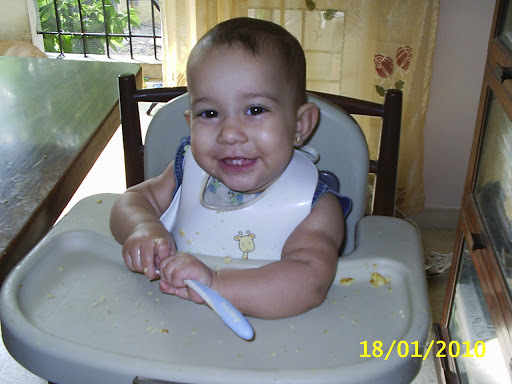 Certain foods can cause alergic reactions in babies simply because their bodies aren’t mature enough to assimilate it. Some foods you should avoid when just starting out are egg whites, tomatos, nuts and nut butters (especially peanut butter), chocolate, and cow’s milk. If alergies run in your family, it would be wise to get your doctor’s advice on foods to avoid. Children will often outgrow alergies over time, but don’t take any chances. I always read that you should wait a week between introducing different foods, but I have never stuck to this too rigidly. I did wait on the above-mentioned foods until my babies were over a year and have never had any alergic reactions with them. (Though you have this to consider with milk.) The older the baby is when you start, the less chance you have of them having a reaction to a certain food. And now I think that if foods are offered in the correct order, the chance of alergies diminishes. I like to start with fruits (banana, papaya, mango, and apple are favorites here) and yoghurt , then veggies (potato, carrot, any that you cook for a short time in a small amount of water, then mash up with the water to retain the vitamins). By 8 – 10 months (once the lateral incisors are through), I start giving them eggs and meats (chicken, beef, fish). Soft meat like liver is good, or you can blend the meat into a paste with a baby food grinder. You may find, however, that your baby will eat it just fine when it is offered in small pieces. I used to give cooked cereals at this time but after reading that article on teeth and digestive juices (see pt.1 of this post), I am holding off for Scarlett. Once they are ready for them, you can give the cereal as is, or blend the grain into a powder and cook in a little water/milk to make it smoother. Oatmeal is a good first cereal. Lila at 8 1/2 months old. By the time my babies reach their first birthday, they eat almost all of what I cook for us, with very little being omitted. Since a good portion of what I cook uses Indian spices, I start by preparing their food separately, then slowly allowing them a little with the spices (usually mixed with some yoghurt) until they don’t mind the spice and digest it well. I don’t make the food too hot, so they get used to it quickly. Actually, most Asian diets are full of spicy food and children get used to it at an early age. We westerners are the ones who eat more bland food and worry about children having even a little spice. My kids love both. Once you start your baby on solids, you will need to offer them water to aid in digestion. When they are only breastfeeding water isn’t necessary, unless you live in a place as hot as I do. There are times when I know Scarlett isn’t hungry, just thirsty, and she will guzzle water from her bottle until satisfied. When Logan was a baby we lived in a cooler climate so he hardly ever touched water, but both Lila and Scarlett started it early since they were born into this heat. You can either use a regular bottle or offer a sippy cup with water at mealtime. Either one seems to work fine; it is just personal preferrence. – Babies don’t need solids until after they get their first tooth, but if the teeth show up early, wait until they are at least 6 months old. – First introductions are just to get baby used to the taste and feel of solids. Breastmilk should still be their main food. – Start with fruits and veggies, then proteins, and finally, grains. – Be cautious when introducing known alergy-causing foods, and watch for any reaction. Avoid them if alergies run in your family. – Offer your baby water once they start solids. Starting your baby on solids is always an adventure, and I’ve learned a lot about it from my own 3. Scarlett is now 8 months old, and while she has had some solids off and on, she isn’t yet regularly eating meals of solids. Instead, most days she will have one meal of something like fruit or yoghurt, and breastfeed for the rest. Breast milk is still the most important food for a baby. It is made for their digestive system, and your body adjusts the nutrients in the milk to meet your baby’s specific needs. This is why you have to continue a nutritious diet while breastfeeding. A baby will begin to show interest in solids somewhere around 6 months old. There is no rush to introduce food so don’t worry if your baby isn’t interested by then. Usually this coincides with the arrival of the first teeth, which usually happens around 6 months but not always. Scarlett got her first two teeth at 3 1/2 months, but a baby’s digestive system is not mature enough to handle solids until after 6 months, so it is best to not give it to them before this age. Something interesting I read recently on another mommy blog said that each tooth brings with it certain digestive juices, so foods should be introduced in a certain order depending on which teeth your baby has, but not before 6 months. 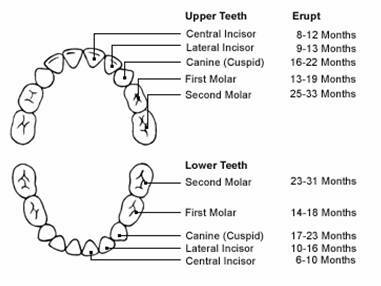 Here is the order: central incisors – fruits and veggies; lateral incisors – proteins; molars and canines – grains. I’m sure many of you are wondering why teeth show food readiness. The eruption of teeth produces saliva with contains digestive enzymes and this generally happen along the same time line as digestion and intestinal development of necessary enzymes. If you are feeding your baby grains before they have the necessary enzymes to digest the grains properly your baby’s body will not digest or only partial digest the grains leading to intestinal trouble and possible allergies. The first time you give your baby solid food, you are not trying to fill their tummy. Rather, you are just introducing the taste and feel of food to them. I like to use my fingers for their first taste of food since they are softer than a spoon. You could get a rubber tipped spoon for later feeding. My favorite first food is banana. I mash it with my fingers and put a tiny amount in the baby’s mouth, just a taste. Actually, that statement is from Logan, not me. And yes, he loves to eat. Real food, that is. He was introduced to solids when about a week shy of 6 months and since then has eaten at least once daily, sometimes twice. What does he like? Anything I give him. He isn’t picky, something I’m very thankful for. He has eaten banana, yoghurt, potato, carrot, apple, orange, cracked wheat, chicken, egg, papaya, french toast, sweet lime, mango…did I leave anything out? All foods are blended or mashed with nothing added, no salt, sweetener, nothing. And he loves it. Whatever I give him, he eats. Many times I have come to the table to eat and if I don’t make sure he isn’t hungry, he fusses for what I have. Sometimes what I am eating isn’t appropriate for him, it’s spicy or whatever, so I just have to say sorry you can’t have it. He looks at me with this puppy dog look in his eyes, so sad that I’m not giving him any. So now I try to be prepared in advance by having some food ready for him to eat when I do. He is much happier with that. Today he had his first “full meal” by eating chicken, potato and carrots for lunch. Before I had only given one kind of food at a time, but so far he hasn’t had any reaction to any food so I am trying this approach. And in case you are wondering, I am NOT giving him junk food like ice cream, chocolate, etc. I don’t want him to get accustomed to that stuff (even though those are my personal favorites, ha). I will let him later when he is older and has a good start with healthy food, but of course in moderation (meaning once in a great while). Maybe his birthday will be a good place to start. All this eating is making him grow bigger and heavier. I can’t carry him around very long before he gets too heavy and I have to put him down. I wish I could show you the pics we took of him sucking on a mango seed, but that will have to wait as I can’t get the pics off the camera until we get some batteries. Must do that soon. He loved that seed and cried when it was taken away. And he was a mess. But what to do? The experience was fun and he loved it. So that is to whet your appetite for the pictures that will come soon. Until then, eat healthy, just like Logan.